See Donate or Siyovle Dies or A Noteable Difference. If you wouldn’t want your kids portrayed that way on someone’s website, than don’t donate to an organization who portrays someone else’s kid’s that way for the sake of invoking pity donations. I will never understand when I look at a website for an organization that’s working in Haiti and everyone on the “Who We Are” section is white. Seriously? But this goes for any organization. If it’s an org working in inner city New York and all the staff is from small town Iowa, then there’s also a problem. Similar to #1. If you wouldn’t want those words describing yourself or your family, then don’t support an organization who describes their demographics that way. If your donation just goes to something that gets given away and used up right away, it doesn’t go very far. Invest in programs that are sustainable and create foundations for future development instead. If the person in charge is able to get donations just because they’re a smooth talker and shrewd business person, and not on the merits of their programming then you need to be careful of what the donations are going for. Also, if there isn’t a system set up to succeed if that one leader for some reason isn’t able to continue leading suddenly, then the organization won’t survive. See Some NGO Doodles. Any organization that receives tax-deductible donations should have these readily available on their website. Some bury them as far in the website as possible. But any organization can also be looked up on GuideStar and all recent IRS form 990’s can be accessed there. If there are no records even on GuideStar then you should really be concerned. Either they’re trying to hide something or are just crappy at accounting. Either way, not a good place to send your money. This one probably isn’t easily known through internet research alone, but if you can do the research it can really tell you a great deal about the organization that you’re looking at. Contrary to popular belief, NGO’s really don’t run the world, but many like to think they do. This means that they do their own thing without ever consulting the local authorities (mayors, deputies, police force, development officials, etc.) But those who are able to collaborate with the local leaders are much more effective at using their resources and stretching them as far as possible. Make sure that the physical structures built, owned, or rented by the organization are justified by the level of activity carried out by that organization and the number of people involved. Far too many donor dollars go to waste by organizations that think that building bigger facilities will lead to more activity but then the spaces go to waste. Make sure that the org is already using every inch of its facilities to their fullest potential and proven the expectation of growth before donating to anymore building. Similar to #8. If any organization thinks that they can do it all on their own then they will be wasting a lot of money where they could have collaborated with another local organization to make both of their resources reach further. No one can do it on their own. See The Politics of Caring. Today, on the 3 year anniversary of the earthquake, I’m going to share with the readers of my blog an excerpt from my book, The Grinder. I usually keep this work pretty tightly protected, as it is yet to be published, but today, I want to share this part with those of you who read The Green Mango. The book is a collection of stories of Haitian survivors of the catastrophe woven into my own experience as we all search for meaning and hope during such an uncertain time. But this particular part is from a chapter entitled “Alphabet Soup” which is directly written about the relief efforts that have occurred in the country after the quake and I think it fits in with many of the themes I touch on in my blog. Note that this was actually written over a year ago. Enjoy. There are certain countries that instill in their citizens a belief that, when they see a messy situation, their nationality has bought them the right to go get involved in making it messier. The single scariest thing in these situations is a bunch of people with good hearts wanting to help but absolutely no cultural knowledge or experience. Good intentions without an understanding of shared humanity are the cause of so many millions and even billions of dollars in aid going to waste as the victims’ dignity gets trampled along the way. The swoopers come in, spend a week, they sweat and they serve doing jobs that the Haitians could have done, then they take their photos back home to show everyone that donated how much “help” they provided. But the Haitians’ lives remain the same. As they leave, those of us who live here frequently find ourselves shaking our heads and telling our Haitian friends, “Well their hearts were in the right place,” in an attempt to justify their ignorance and encourage the Haitians not to judge our whole country based on their misguided actions. We say their hearts were in the right place because we’re ashamed to admit that their minds are still unknowingly lost in ethnocentric perceptions of poverty. […]Even now, long after the quake, mouths continue to spout unnecessary assessments at the little country to try to quantify what all went wrong in the relief effort. They think they’re words are going to help turn things around but no matter what they say, it just seems to make things worse. Words like “mismanagement of funds,” “corrupt leaders,” “organizational mess,” and “wasted resources,” all try to define with language a situation that any Haitian can tell you defies language’s limits. My friend Choumimi, who works as a police officer in Port-au-Prince, was very closely involved with all of these relief efforts, both national and external, because of his position. When I talked to him almost two years after the quake, his attitude towards everyone’s opinions on the failures of relief was basically, “Why can’t they just shut up and let us live? We were better off before and we know what we need.” He told me that all of these outsiders trying to fix things or trying to determine why things can’t be fixed were acting like doctors trying to treat a patient without ever asking the patient what’s wrong. “They’ve screwed up every chance that we had to ever recover.” He told me. Choumimi gave me a clear example. He said that I could walk into his house and see him sitting at his table with all of the parts to a telephone sitting on the table in front of him. I could see that he clearly needs a telephone, and as chance would have it, I know exactly how to put a phone together from all of those pieces sitting in front of him. But, instead of showing him how to put the phone together, I just go out and buy him a new telephone instead. “What good does that do me?” Choumimi asked emphatically. The cliché, “Give a man a fish…” may be used in any other situation but Choumimi’s parable was purely Haitian and spoke volumes to the current struggles that his country was experiencing. Well-meaning humanitarians who know thoroughly the trappings of creating dependency with top-down charity systems seem to lose their good sense in such a catastrophic emergency. They forget to practice everything that they preach and throw all the rules of sustainable development out the window as they kick into hero mode and bulldoze over a population’s right to creating their own solutions. Haiti had all the resources that it needed at its fingertips to recover on its own. They could have rebuilt their own country. They may have appreciated some advice on how to put all of the pieces together but now they’ll never know how. A new country cannot be bought in the street, it must be rebuilt. But because of all of the promises of what billions of dollars could buy, they’ve lost faith in those resources that they had and been shown that they have no value. And that destruction of faith in one’s own self-worth, or collective worth as a country, is much more impossible to rebuild than buildings made of cement. This isn’t all to say that foreigners shouldn’t come try to do good things in the country of Haiti. There is a lot to be done and as fellow human beings we all need to carry the load of our brothers and sisters together. We just need to be aware of how we do it as to not make the load heavier. Haiti’s back could easily break from the unbearable load of tents, tarps, clothes, and food dumped upon her. But those who come in with understanding, open minds and effective organizational planning, truly do have the potential to help relieve some of the stress that’s been put upon this abused little country. 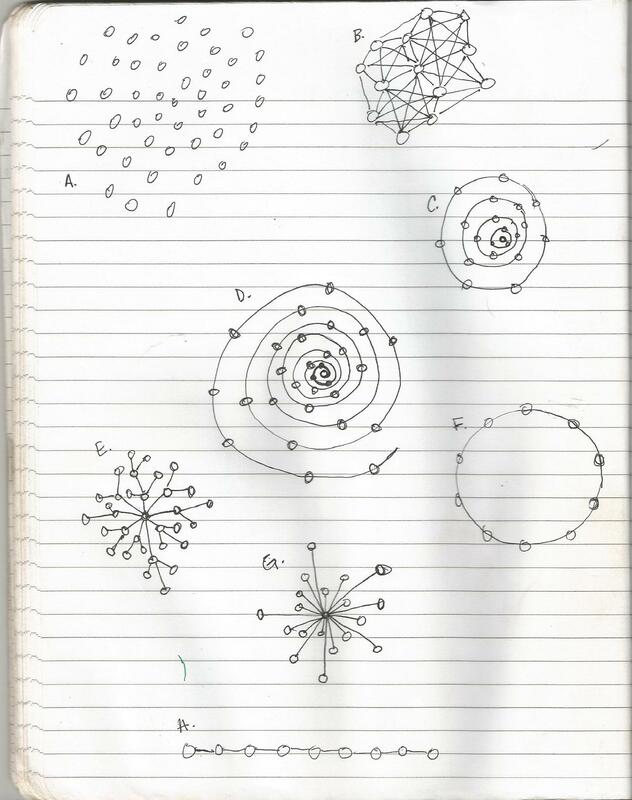 I woke up yesterday morning thinking about the structures that organizations follow and I made the following drawing in my notebook. I don’t want to go in and analyze the drawing but I think that many people who read my blog frequently can maybe know what I mean by these doodles. Everyone can argue forever about which system is better than others, but I definitely know organizations here in Haiti and internationally that fit each one of these models. Some are very dependent on one single person and if you take that person away the whole structure falls apart. Others lack the potential for sustainability or a plan for succession whereas others just lack leadership. Then there are some that keep everyone actively involved and connected to the others and some models that allow for more room for growth. Each system has pros and cons depending on who you ask. If I thought about what I do here in Haiti I know where I think I would place my own organization but I also think that my existence here when considering all the things I’m involved in besides my organization fits a completely different pattern. So anyway, there’s the drawing. I simply wanted to share it as a way to think about why so many different groups exist and why we can’t seem to agree on anything at times. I’ve been back in Haiti for a few weeks now after a long stay in the states and I think that the biggest thing that I’ve learned so far is that the work you do should be done in such a way that everyone else can carry it out in your absence but the life that you live should be lived in such a way that it makes everyone desire your presence. I think this has something to do with this drawing as well and it is a conversation that I’ve been having with some friends in the nonprofit world lately. I hope that I’ve built an organization in such a way that if something would happen that as of tomorrow I could no longer be involved, then everyone else involved would be able to continue towards the same goals without me. But, as long as I’m alive and well, we might as well keep doing it all together. Because we all like each other (most of the time) and things just work better with everyone collaborating. I think it’s a little silly when organizations have the attitude that the leaders, whether outsiders or local, have to train new leaders and then get out. I think it’s much more effective to train new leaders to join the current ones. Train new leaders in case the current ones have to leave, but until that time, lead together. I had made the decision to move back to the states although staying involved with my activities here in Haiti, and so far am planning to stick with that decision. But I still don’t know exactly what the whole solution to making that decision work well looks like. I think part of the solution lies in decoding this drawing. Whatever lines and shapes lead to defining that solution I know that they will align to make a beautiful work of art nonetheless, something more than just some messy squiggles. Too many messy squiggles in this world already.